A page layout (often referred to as a layout) is a collection of map elements organized on a virtual page, designed for map printing. Common map elements that are arranged in the layout include one or more data frames (each containing an ordered set of map layers), a scale bar, north arrow, map title, descriptive text, and a symbol legend. In Layout view you can add map elements such as north arrows, legends, and scale bars, as well as, frames that contain the geographic data or the maps themselves. Other finishing touches can be added to a Layout using a full suite of graphics and graphic editing tools. 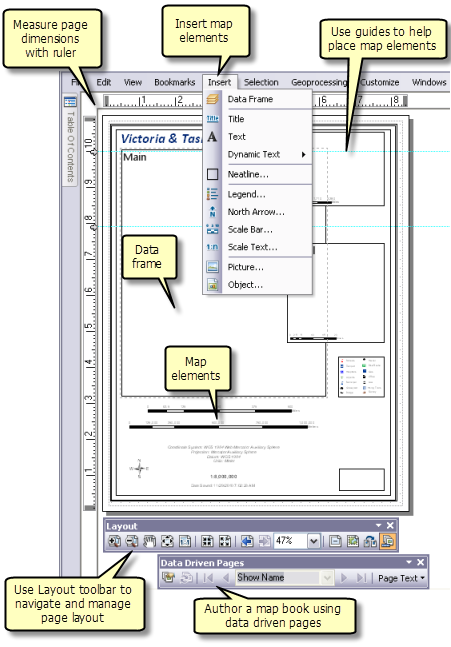 Rulers and guides can be used in the Layout View to help you accurately measure and organize the elements on the page. What you see on the layout is what you get if you print or export the map to the same page size. 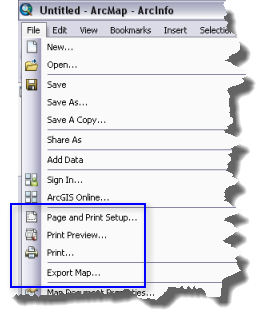 The first step in ArcMap is to change your map view to layout—either by selecting Layout View from the View menu or by clicking the Layout View button on the lower left of the map display. In order to save time you may want to consider using a template to preconfigure your layout. 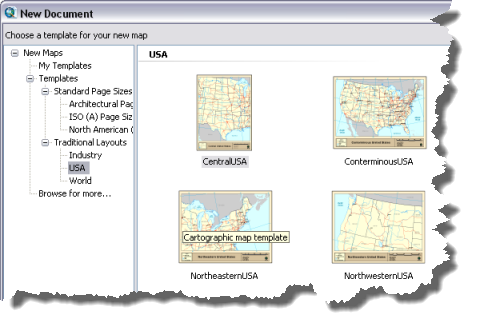 When starting a new document you can use one of the templates included with ArcMap or create your own. Using a template is optional. You can author your layout from scratch. Once you are working in layout view, you can set up your page orientation and dimensions using the Page and Print Setup dialog box. Use the Change Layout button on the Layout toolbar to change page orientation and element placement of an existing layout. The data frame displays a collection of layers drawn in a particular order for a given map extent and map projection. You add a data frame to the page layout using the Insert menu. From this menu, you can insert additional data frames. These additional data frames may be for locator or detail maps. If you are using multiple data frames you may want to consider using extent indicators to show the extent of one data frame within another data frame. A good locator map will also contain an indicator, such as an outline, showing where the extent of the detail map fits within a larger extent. For example, your locator map might show the location of a state within a country. When your map document contains more than one data frame, only one will be the active data frame, that is, the one with which you are actively working. The active data frame name is shown in bold in the table of contents and the frame will be highlighted on the page with a dashed outline. To make a data frame active, right-click on its name in the table of contents and select Activate or single-click the data frame on the page layout. Clicking once on a data frame in the layout selects it and allows you to access its graphic properties. Eight selection handles will appear as squares at each corner and on each edge of the frame. These handles can be used to resize the frame, and by clicking and holding down the mouse cursor anywhere in the frame, you can reposition the data frame. Double-clicking the data frame gives it focus. A black hatched line appears around the frame. This allows you to interact with the map contents as you would if you were using data view. If you are in layout view and find that you can't select a graphic because it was added in data view, give the data frame focus. Use the Insert menu to select other map elements to add to your layout. You can use this menu to add a Title to the page. The added text will be the same as the text entered for the title in the Map Document Properties dialog box. Along with a title you can add (static) Text and Dynamic Text. You can use the Insert menu to add a Legend, North Arrow, Scale Bar, and Scale Text. Clicking any of these options opens an appropriate wizard or dialog box where you can set properties for each map element. You can also add neatlines, pictures, and objects from the Insert menu. The Draw toolbar can be used to add graphic shapes such as rectangles, lines, and points. You can also add graphic text and edit text properties. As you add map elements, you can edit their properties, size, position, and appearance, and arrange them on the page with other map elements. From the View menu you can toggle on Rulers, Guides, and a Grid to aid you in positioning elements on the page. You can also access placement aids in the layout view context menu. Open this menu by right-clicking the page layout. You can set properties for these placement tools using the Layout View tab of the ArcMap Options dialog box, which is available from the Customize menu. Here, you can set the units and division values for the page ruler, and set the spacing for the grid. You can also set a snapping tolerance if you want your elements to snap to any one of the placement tools. Options on the Layout View tab also include ways to manage the appearance of the layout view. You can choose to stretch the contents of the view when the window is resized, and in addition to displaying horizontal and vertical guides, you can choose to disable the display of the dashed line around the active data frame. To work with individual elements, select the element or elements you want to work with and right-click to open the element context menu. Here you can zoom to, Cut, Copy, or Delete the selected element or elements from the page layout. In some cases you may want to convert a dynamic element, such as a legend or scale bar, to graphics in order to apply greater control over their display. The menu provides options to Group or Ungroup elements. Grouping elements is a good way of managing a page layout with many elements. 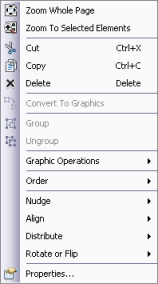 This menu also provides commands to further manipulate graphics through Graphic Operations and placement commands. Placement commands include the ability to place elements in a specified drawing Order, Nudge, or move the element in a particular direction, Align, and Distribute multiple elements on the page. You can also Rotate or Flip an element. When you have more than one graphic selected, the blue handles indicate the dominant graphic, or the one that ArcMap will use to align other graphics. To change the dominant graphic, hold down the CTRL key and click the selected graphic that you want to be the dominant one. You can change the size of map elements by selecting them and dragging the selection handles. The cursor will change to an arrow when clicking and holding a selection handle. Dragging a handle in either direction will resize the element. You can also use the element's properties dialog box—Size and position tab—to position the element. Here, you can set an anchor point, position the anchor on the page, adjust the height and width of the element, and choose whether to preserve the aspect ratio of the element when it is resized. You can only change the size, position, and frame of an element after it has been placed on the map. The Layout toolbar is used to navigate the page layout. It is enabled when you are in layout view. You can pan and zoom in/out on the page. You can also jump back and forth to previous page extents or specify a zoom percentage based on the page size. Other options for navigating in the page layout include the Layout View context menu, changing the active tool into a navigation tool (link to navigation guide) by using the keyboard, and using the mouse wheel to zoom in and out. You can access the layout context menu by right-clicking in any open area on the page. 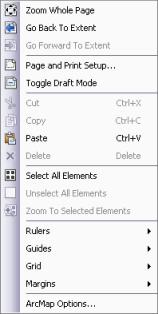 The layout context menu offers ways to work with the page layout. Along with access to the placement aids (Rulers, Guides, Grid, and Margins), this context menu provides a few commands to quickly change the view of the page, access the Page and Print Setup dialog box, Toggle Draft Mode, and work with selected elements. When in draft mode, using Toggle Draft Mode, the contents of the page elements are not drawn. Instead, only the bounding box of the frame and a label showing its name are drawn. This makes it faster to work with the page layout because you don't have to wait for the contents of frames, especially data frames, to draw. You can control draft mode for individual elements through the Frame tab of the element's Properties dialog box. Data Driven Pages gives you the ability to generate a set of output pages by taking a single layout and iterating over a set of map extents. The extents are defined by the features in a layer and are sometimes called tiles, sections, or areas of interest (AOI). A single layout defines the map composition for each data-driven page. Only dynamic parts of the layout change with each page. Static elements stay the same. Any changes made to static elements of the layout will be reflected on each page of the map series. Grids and graticules are used to display coordinate positions on the earth. Graticules show lines of latitude and longitude for the earth, while grids show measured locations based on a coordinate system or can be used as a reference system for a grid index. For example, you can place a grid that divides a map into a specified number of rows and columns by choosing the reference grid type. Deciding which option to use depends on the requirements of the grid or graticule you want in your map. Once you have completed this work on your layout, you can print your map or create other types of output formats—PDF files, PostScript files, or Illustrator files. Under the file menu you have the options to open the Page and Print Setup dialog box, Print Preview, Print the page, or to Export Map. Before starting in ArcMap, it's wise to design the arrangement of the elements onto the map page and plan your layout. Create, edit, and symbolize your data as appropriate in your data frame(s). In layout view, click the Insert menu to add elements onto your layout. If you have more than one data frame in your map, the elements you insert will relate to the active data frame (to activate a data frame, right-click its name and choose Activate). When you add map elements (for example, a scale bar), the map reflects your updates. You can select, reposition, and modify map elements. Right-click a selected element to access its shortcut menu and set additional options.